Fuse Tool and Protecting Bookmarks and Other Pieces - Sprite Stitch Board! Hi everyone. So I fell out of the cross-stitch phase and tumbled into paper crafting a few years ago. Mostly cardmaking and scrapbooking. This year a new product came out called the Fuse Tool by We R Memory Keepers. It's basically a hot knife but it comes with a perforated head so you can make those little dashes you see on page protectors. This thing is meant to fuse plastic so you can make a customized scrapbook page and it just hit me a few days ago that this is the perfect solution to that age old question of "How do I protect my cross stitched bookmark?" Laminating didn't work because the piece would be too thick/bulky, but with this you're putting it in a pocket and many people are using the tool to make shaker pockets filled with sequins or other embellishments. Also page protectors are much cheaper than laminating pouches and you can easily mount your work on cardstock to hide the back without worry for the bulk. You don't even need the fuse tool. You can just use a hot knife/wood burner. I've even seen someone use the tip of a hot glue gun but you don't get clean lines with that. However, page protectors are very slippery. Unlike paper/fabric, there's no tooth to grip to the paper (I learned this the hard way with a metal bookmark) so here's some solutions for that. This video has the pocket attached to a paper clip like a banner. You could just attach the paper clip to the page. Or make a long strip into 3 pockets. Two big even ones on each end with a narrow (maybe 2 inch) one in the middle. Fill the end pockets, seal and attach the magnet. Leave the middle empty (or not) but fold in half and fuse the existing fused lines of pocket 1 and 3 together (or fuse slightly above it. The middle pocket is now a loop that sticks out the top of the book. If you put some thick cardstock in there, it'll hold a folded shape more easily. You can then punch out a hole on that middle pocket and add eyelets, brads, charms, ribbons, or tassels now. This can also be used to protect refrigerator magnets. In my house, the fridge is within two feet of the stove and over time grease/steam/dust will coat the area around it including the fridge. I never dared to attach something I cared for that could be irreversible damaged. Not even with those acrylic magnet frames because the edges would be exposed. However now I can just wipe my work with a wet towel and if I find the plastic is in bad shape still, I can cut it open and replace it. 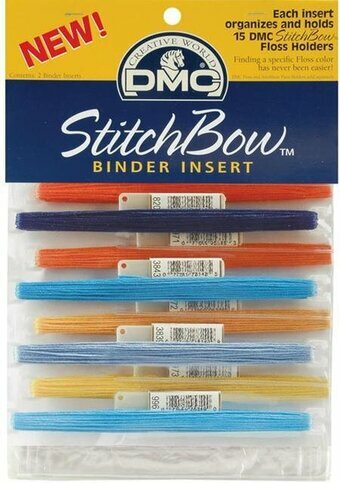 And for people using the DMC stitch bows, you can making your own binder inserts now. They're about $4 to $5 for two sheets so you can really save if you make your own. I've seen a pack of 200 8.5" x 11" page protectors for less than $10 at Sam's Club. I'm not sure how much wear and tear a small fused pocket can handle though and if the DMC inserts are made of stronger material. I'm sorta tempted to fuse some rocks into a pocket and sling it around outside just to test how long it takes to break. I'm so excited with all the possibilities. I need to start stitching again so I'll have something to fuse. I don't have the Fuse Tool, but I do have a wood burning kit that I never opened so I'll need to unearth it first. 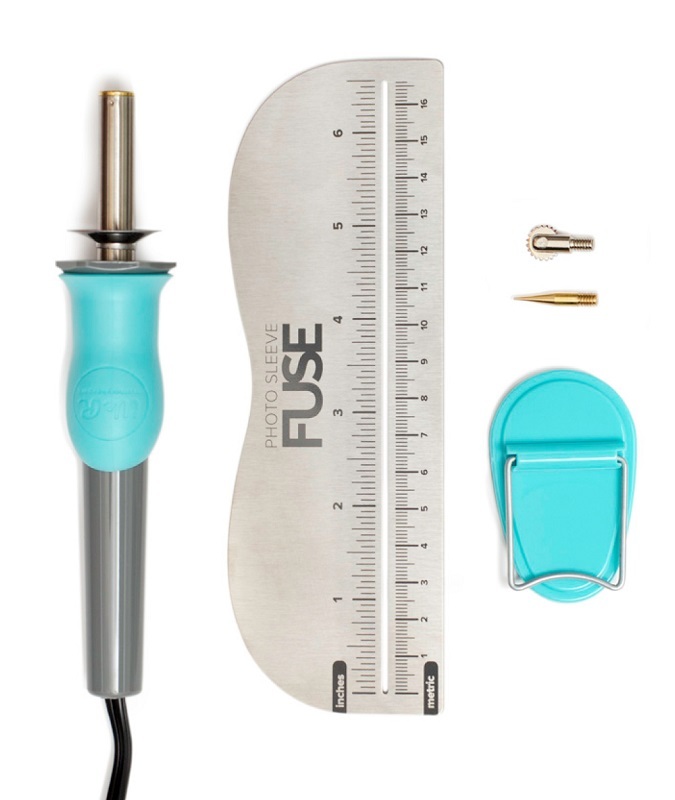 If you don't have any hot knife/woodburning tool or want the Fuse Tool, it retails around $25 to $30 USD. Michael's carries a white Project Life version in the scrapbook section for $29.99. They occasionally (very very rarely) have a 50% off coupon and usually just have 40% off. However, they also take competitor coupons in store. Check the Joann's or A.C. Moore website to see if they have the 50% off. A.C. Moore is your best bet because they seem to have them at least twice a month. (Never pay more than half price there again!) As long as there's not a Project Life sale going on that week, you can get the tool for $15. If you don't care about having the perforating tip, check the wooden items isle for a wood burning kit instead. They come with at least 5 times as many different tips. The perforating tip is mostly to make it easy to keep the plastic from being completely cut through with a normal tip without have to continuously dot it yourself.